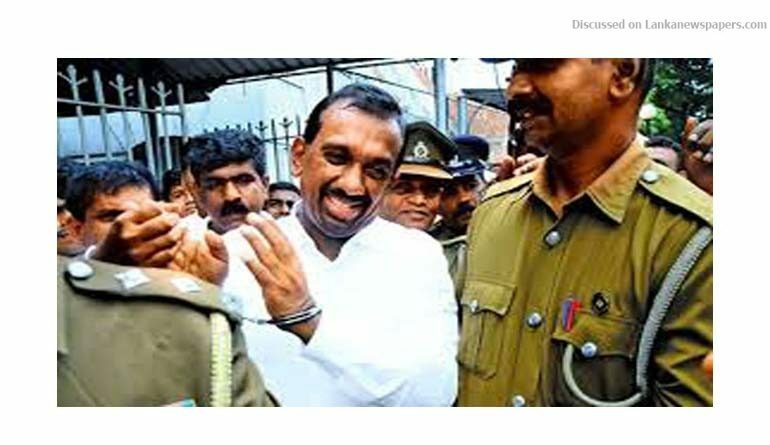 Former Minister of Sports Mahindananda Aluthgamage was yesterday (16) remanded until today (17) the Colombo Fort Magistrate, Lanka Jayaratne, due to his failure to fulfil bail conditions. Aluthgamage was arrested by the FCID on a charge of financial fraud to the tune of Rs 39 million in the purchase of sports equipment. When produced before Magistrate Lanka Jayaratne yesterday, he was allowed bail in Rs 35,000 cash with a surety in Rs 100,000 and ordered to surrender his passport to the Court. However, since he failed to surrender his passport the bail order was cancelled and he was remanded until today. The MP could not confirm that his passport was in the custody of the High Court. Aluthgamage was arrested and produced before the Colombo Fort Magistrate’s Court, after a statement was recorded by the Police Financial Crimes Investigation Division (FCID). The statement was with regard to an allegation regarding a financial misappropriation of Rs 39 million in connection with the purchase of carrom and draught boards when he was the Minister of Sports in 2014. Counsels Shavendra Fernando, Kanchana Ratwatte, and Namal Rajapaksa represented the MP in Court. The FCID noted that former Secretary to the Ministry of Sports Nanda Mallawarachchi had sent a letter in November 2014 to purchase the items, while it was the second accused, former Chairperson of Sathosa Nalin Ruwanjeewa, who had made the purchase on the verbal directives of Aluthgamage. Accordingly, the stock of equipment, which was not distributed by the Ministry, was found in a Sathosa warehouse. That stock is alleged to have been distributed as an incentive during the 2015 Presidential Election as part of the Sri Lanka Freedom Party campaign. President’s Counsel Shavendra Fernando, making his submissions noted: “The second suspect in this case, former Sathosa Chairperson Nalin Ruwanjeewa is currently out on bail. I am aware of his bail conditions. It has already been decided that the Sathosa does not fall under the Offences against Public Property Act. However, this loss is borne by the Sathosa. No one has challenged the Court orders, therefore it is still valid. However, a ‘B’ report has been filed citing violations of the aforementioned Act. That is illegal. The Attorney General as well as the FCID is bound by that Court order. Filing this ‘B’ report to challenge the previous Court order is an attempt to humiliate the Court. Even the Police Superintendent’s report has not been submitted. ”However, the FCID noted that the report was filed during the last Court date. Magistrate Jayaratne, said: “There is no need to file separate Police Superintendent certification for individual suspects. These equipment have been purchased by the Sathosa. The Ministry has not paid for it. The taxes for the equipment which should have been paid by the Ministry have not been paid. It is the Sathosa that has not followed the due process. ”Accordingly, the Magistrate noted that though the Ministry has not incurred a loss in this purchase, the loss had however been borne by the Sathosa which is registered under the Companies Act and not the Offences against Public Property Act. On these grounds, bail was granted to the suspect. However, due to the suspect being unable to produce his passport, which is reported to be in the custody of the Colombo High Court, and also because he could not confirm whether the passport was in the possession of the High Court, the suspect was remanded until today. Media personnel faced difficulties in reporting Court proceedings which took place under heavy Police security. Court reporters faced immense difficulties as they were barred from entering the Court premises by the security.